The diagnosis of democracy’s decline is troubled because there is little clarity behind the definition of democracy. Most people believe democracy is the presence of elections. But the existence of unfair and unfree elections in many countries has made the mere presence of elections a low bar for the presence of democracy. Steven Levitsky and Lucian Way have established the term Competitive Authoritarianism for countries who have elections with genuine competition but remain authoritarian at their core. The failure to properly define democracy has allowed authoritarians to claim the mantle of democracy. Viktor Orbán has championed the illiberal democracy. China claims it represents a form of democratic centralism. Freedom House has begun to classify countries as electoral democracies who give their citizens political rights but lack the fundamental civil liberties necessary for a robust liberal democracy. 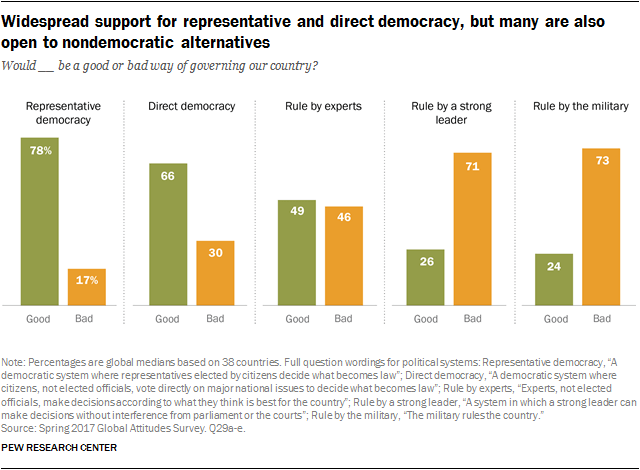 The Pew Research Center under the guidance of Richard Wike has conducted a number of surveys to better understand attitudes towards democracy around the world. A recent survey from 2017 examined opinions towards representative democracy but compared them to a few alternatives. They also examined opinions on direct democracy, rule by experts (technocracy), rule by a strong leader (autocracy) and rule by the military. The results found strong support for representative democracy but the support for other forms of government were stronger than expected. Representative democracy was considered a good way to run the country by 78% and a bad way to govern by only 17%. But direct democracy was not far behind. It was considered good by 66% and bad by 30%. This demonstrates the public places a greater emphasis on elections within democracy than the ability to build consensus among different interests. Direct democracy is an effective way to make a final decision but does not allow for the opportunity to compromise especially on the finer points. Compromises and implementation create conflict when they contradict expectations. The problem in direct democracy is everyone has different expectations. A plurality supported technocracy. It failed to hold a majority who felt it was a good way to govern. Only 49% supported a rule by experts but only 46% opposed it. Younger voters disproportionately supported this option. It is possible many did not see a contradiction between technocracy and democracy. Many political institutions in Western Democracy are already technocratic like the Federal Reserve, the Civil Service and the courts. Yascha Mounk has expressed his concern about the rise of undemocratic liberalism as Western democracies limit the role of representation in political institutions. Most people rejected rule by a strong leader. About 71% felt this was a bad way to govern. But 26% liked the idea. The problem I have with this question was it was meant to represent dictatorial government. But many Americans may not see a contradiction between strong leaders and democracy. The Presidents most revered are regarded as strong leaders. But this critique is not fair to the survey. The questions asked about “a system in which a strong leader can make decisions without interference from parliament and the courts.” I still believe many Americans who support this statement do not see a contradiction with democracy. A surprising 22% felt this was a good way to run the country. The survey also showed the political right was more likely to support autocracy. There was a 10-20% gap between the political right and left on this question. With the exception of Venezuela. The Bolivarian Socialist state flipped the script. There was a 31% difference between the political left and the right. The support for autocracy is not a part of right-wing political ideology. It is a belief their policies would prevail in a non-democratic system. Venezuela demonstrates the political left is capable of non-democratic sentiments when their policies are put into practice. This is the Democracy Paradox.